Thomas Edison's Talking Doll: "Despite several years of experimentation and development, the Edison Talking Doll was a dismal failure that was only marketed for a few short weeks in early 1890....Edison's Talking Doll was an historic step in phonograph history -- the first phonograph marketed for home entertainment, with a pre-recorded cylinder. The doll stands 22" high and weighs four pounds, with a metal body, articulated wooden limbs, and an imported Simon and Halbig #719 bisque head. The original price was $10 with a simple chemise, and $20-$25 with full dress. This was a huge sum for the time, equal to about two weeks salary for the average person. 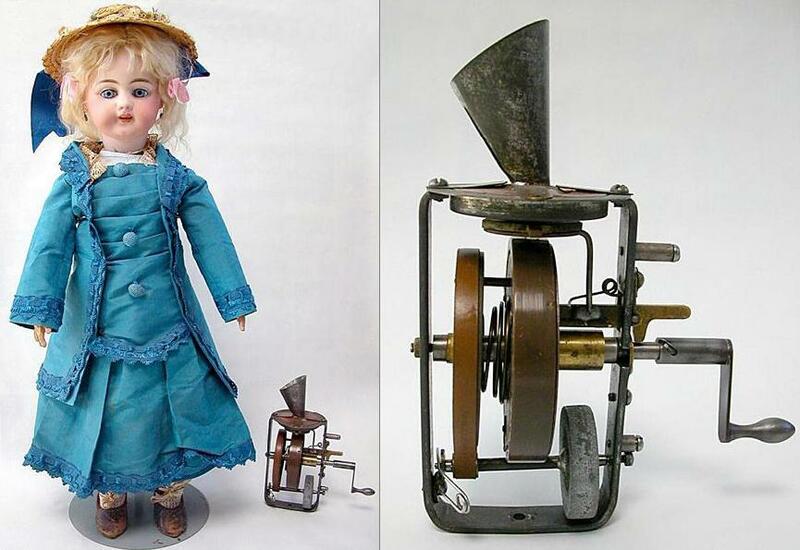 The phonograph inside the body of the doll was tiny, with a small horn pointing up toward holes in the doll's chest. Cylinders were not interchangeable. There was no spring motor so the child was expected to turn the crank by hand at a steady speed in order for the doll to recite the six-second pre-recorded nursery rhyme. (Edison was later quoted as admitting that "the voices of the little monsters were exceedingly unpleasant to hear.") Unfortunately the delicate mechanism was too fragile for rough usage, and the steel stylus caused the wax record to wear out extremely rapidly."